This Song Produced by Von Vargas.. Video Shot & Edited by Von Vargas This song was something I decided to put together featuring 10 other Baltimore Artists to speak out on unnecessary gun violence in support of the Baltimore Cease Fire Campaign. “Baltimore Cease Fire” Von Vargas ft. Greenspan, Josh Lay, Femi The Drifish, Smallz, Blaqstarr, TT the Artist, Martina Lynch, Ill Conscious, Preme, and The Boy Blesst. This is a sample of the Video "Red Lips". Please See Full Video in Project Section. About Red Lips For years now, sexual assault/domestic violence awareness has been on my heart, mainly because I've witnessed the act as well as know survivors and victims first hand. My goal is to do my part by bringing attention to the issue, especially through music. My passion for creating awareness provoked me...and so, I have prepared a short music visual accompanied by my song, titled "Red Lips”. This is a "in" studio video of Von Vargas x Josh Lay performing "Oh My City" off of 3220 The Soundtrack which will help raise a $10,000 Music Scholarship. The latest Album Metropolis Binocular (Part 1) by Von Vargas is some of Von's most transparent work to date. It features the woes of childhood in underprivileged environments, losing family members to the trap "Oceans Fade", with honest and heartfelt lyrics. The album is well balanced with "Thought Provoking" and "Introspective" songs such as "Red Lips", "Cry A Tear", and "One Thing". Expressions that are reminiscent of growing up such as the title song: "My Metropolis" and "Fit Out". Other songs like "Frozen Cupz", "Penned Pola" and "Good Day" pay homage to urban life while helping to change one's outlook on it. "Symphonious Maxim" reveals Von's vital points of life as he declares his thoughts of wanting to give up on his dreams. All in all Metropolis Binocular is a solid piece of work. This is my Album Cover for my latest album Metropolis Binocular released March 2016. Penned Pola Full Music Video from the album Metropolis Binocular. 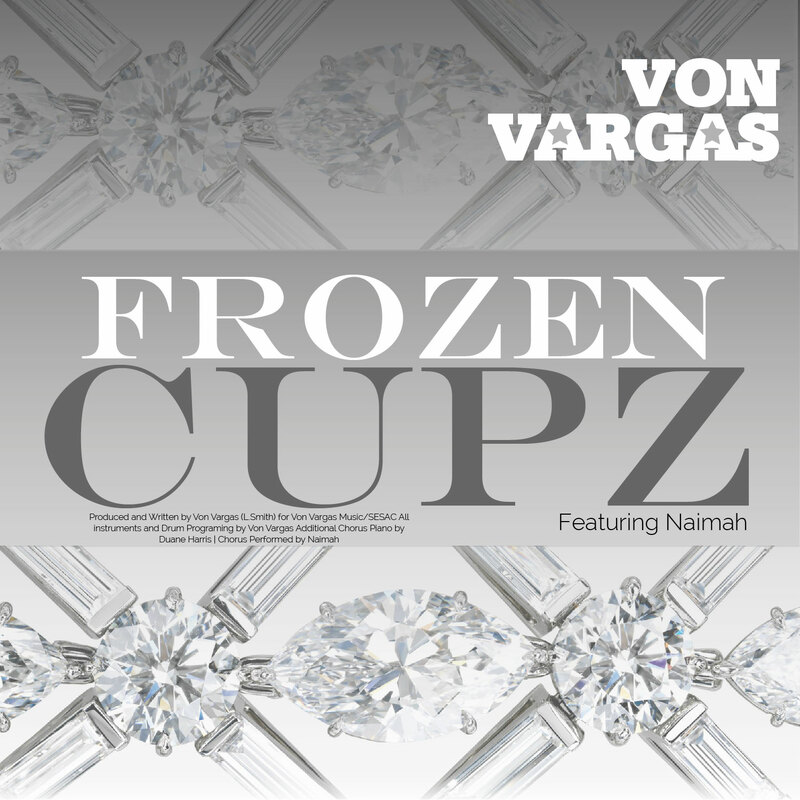 Produced, Recorded, and Written by Von Vargas. Featuring Female Vocalist Ronika. About Red Lips (From The Album Metropolis Binocular) For years now, sexual assault/domestic violence awareness has been on my heart, mainly because I've witnessed the act as well as know survivors and victims first hand. My goal is to do my part by bringing attention to the issue, especially through music. My passion for creating awareness provoked me...and so, I have prepared a short music visual accompanied by my song, titled "Red Lips”. This video features footage of Von Vargas originally performing his song "Concrete (Still I Rise)" from the Album Metropolis binocular. The footage was shot at Von's Live Curated Experience: In My Own Lane. This is a quick snippet of one of several studio sessions for the song "My Metropolis" off of Von Vargas' album Metropolis Binocular. This session features singer-songwriter Naimah laying her vocals for the chorus. This is a quick snippet of one of several studio sessions for the song "One Thing" off of Von Vargas' album Metropolis Binocular. This session features HTK laying his vocals. This is a full video for a song from Von Vargas titled "Look Up" off of the album Metropolis Binocular. This video was directed by Grasshopper Philms, Edited by Bryan Grasshopper Robinson , and Von Vargas The song is about how I have look up or (keeping my head to the sky) to keep from allowing my surroundings and what goes on in my neighborhood to contaminate me. This is my iTunes Digital Booklet for the album Metropolis Binocular. The booklet includes: Song Titles, Lyrics to each Song, Writing, Production, Recording, Mixing, and Mastering Credits and Thank You's. Please feel free to read or download. A collective group of “City Knights” spearheaded and executive produced by recording artist, and City alumnus, Von Vargas, will raise money through new album ‘3220: The Soundtrack (to Baltimore City College)’. Proceeds from this album will provide college scholarship awards for students pursuing music in the entertainment field who graduate from Baltimore City College. The album is dedicated to celebrating the heritage of Baltimore City College and is set to release in Fall 2017. Miller, Josh Lay, Lee Mo, Rufus Roundtree, Kia Miller, The Boy Blesst, Kidd Savage, and Sheri Booker. This is the album cover artwork for 3220 the Soundtrack to Baltimore City College. The project will help raise $10,000 for music scholarships. 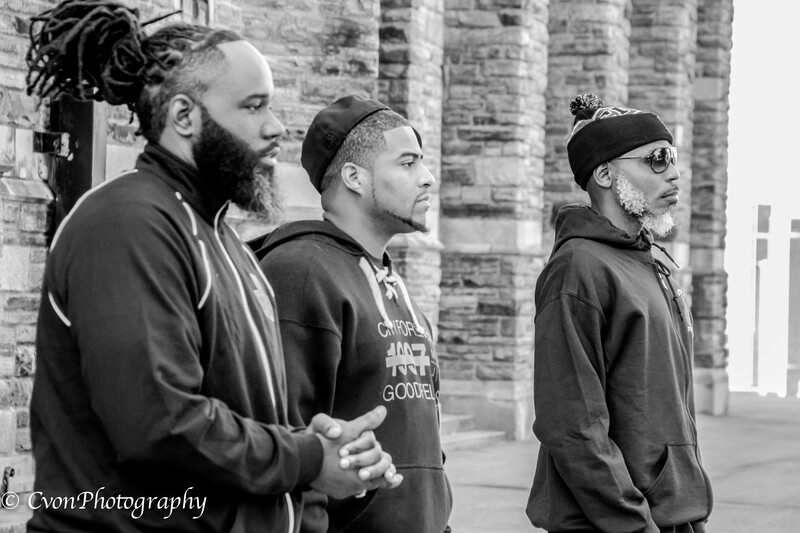 A collective group of “City Knights” spearheaded by recording artist and fellow City Alumnus, Von Vargas, will raise money through their new album, "3220: The Soundtrack (to The Baltimore City College)". Proceeds from the album will provide a college scholarship award for a student graduating from The Baltimore City College, who is pursuing a career in music/entertainment. 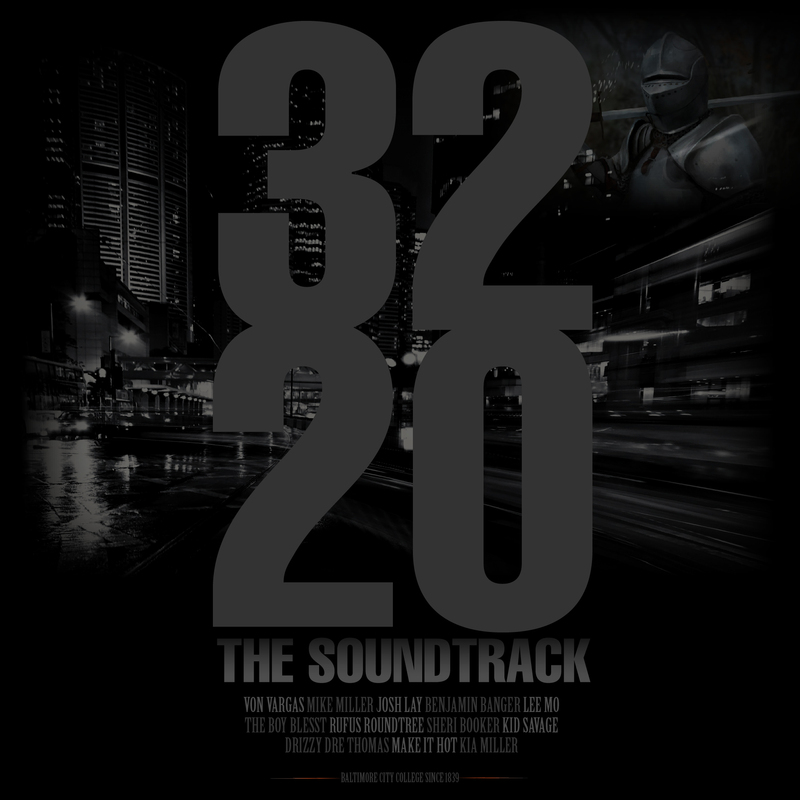 Here's a chance to preview a few songs from the forthcoming album 3220 The Soundtrack. This soundtrack is dedicated to Baltimore City College. It was spearheaded and executive produced by Von Vargas. This is a snippet of Von Vargas, Josh Lay, and Mike Miller performing "Rings to The Sky" at Baltimore City College's Mid-Knight Madness Battle of the Sexes Game. FOR IMMEDIATE RELEASE Baltimore City College Alumni Set to Raise $10,000 Music Scholarship with New Album Baltimore City College alumni will help a student pursue a degree in Music Arts/Entertainment by creating a music scholarship funded by proceeds from new album. BALTIMORE, MD (September 20, 2017) — A collective group of “City Knights” spearheaded by recording artist and fellow City Alumnus, Von Vargas, will raise money through their new album, "3220: The Soundtrack (to The Baltimore City College)". In Studio Footage and Tracks from Von Vargas the Producer. Von Vargas "In Office Pt 2" Creating Song Ideas. Von Vargas "In Office Pt 2” Creating Song Ideas. Another way I like to create ideas. These are Private Tracks Fully Produced by me (Von Vargas). Please Do Not Share any Links. Thank You! Von Vargas "In Office Pt 3"
A quick look at Von building a drum pattern. 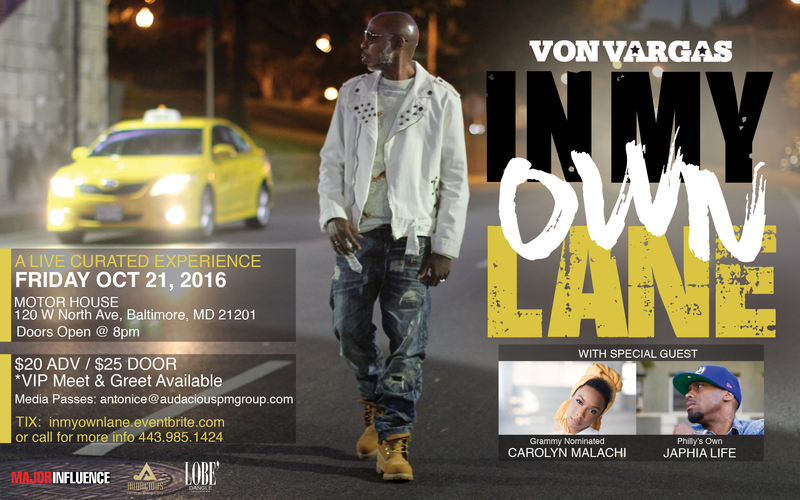 Von Vargas hosts ‘In My Own Lane’ with Special Guests, Grammy Nominated Carolyn Malachi & Philadelphia's own, Japhia Life, in Washington D.C. (September 20, 2016) – ‘In My Own Lane’ is a LIVE curated concert experience hosted by recording artist, Von Vargas, that will take place October 21, 2016 from 8-11 PM at the Baltimore Motor House. This premier concert will showcase talented recording artists that have cultivated their own lanes in the music industry. The audience is given the opportunity to engage with artists, producers, music industry executives, and more. 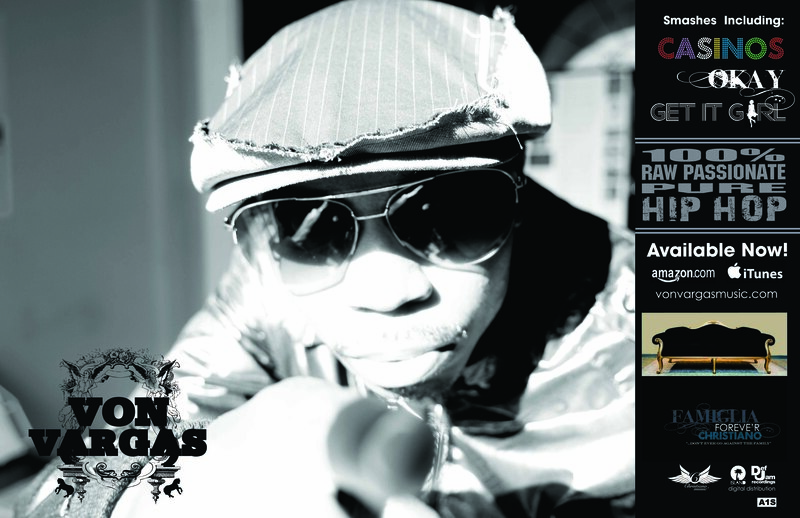 Recording Artist Von Vargas will perform his music for guests, along with GRAMMY-nominated artist, Carolyn Malachi, and Philadelphia's own, Japhia Life, former recording artist with Sony Music. A meet and greet for performers, VIPs and Media will take place at 7 p.m.
During the concert, three dynamic, creative professionals will be honored for their creativity in the music industry. Honorees include producer, Mr. Wendel Patrick, entertainment public relations extraordinaire; Ms. Candice Mackel; and musician, Mr. Rufus Roundtree. ‘In My Own Lane’ was birthed to be a platform for artists who are charting their own lane. This is the postcard promo for In My Own Lane Curated by Von Vargas this past Oct 21st 2016 at the Motor House. This is a snap shot video of a rehearsal with the band for the show In My Own Lane. 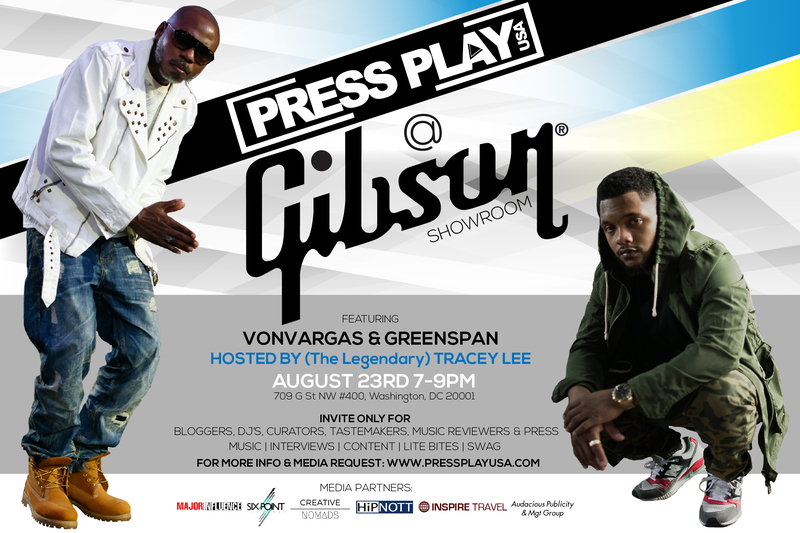 This is an interview with Von Vargas before he performs at In My Own Lane. This is the In My Own Lane Promo Commercial Video "In My Own Lane" A Live Curated Experience by Von Vargas w/ Special Guest "Grammy Nominated" Carolyn Malachi & "Philadelphia's Own" Japhia Life! Friday October 21, 2016 Join fans, music industry tastemakers and executives for a rare experience of music, networking and recognition to musical and creatives within the music industry. Intimate Setting w/ Limited Seats Available. One of the Oldest Markets in the World now becomes Hip Hop's latest Inspiration. 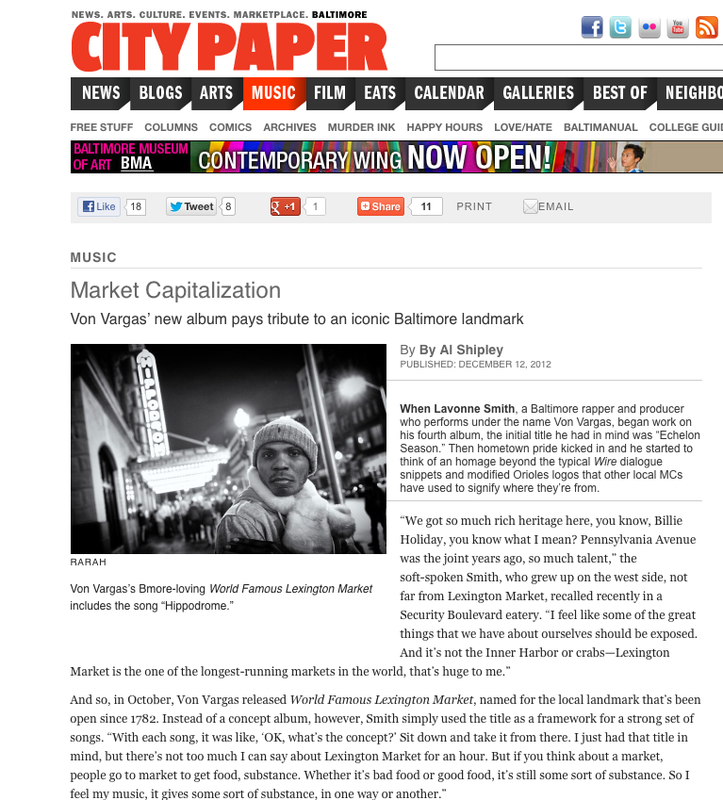 Von Vargas is the first to title an album after Baltimore's historic downtown market. World Famous Lexington Market. Von's Album World Famous Lexington Market takes an affectionate, but never saccharine look at Vargas' hometown, with tracks like "Maryland Crab" and "Hippodrome", says A Shipley of 'City Paper's Rap Sheet'. When asked "Why the title?" Von answers, "Lexington Market is one of the longest running markets in the world, and that;s huge to me; to live here and have this place right at our disposal...I think that's insane!" He also states, "people normally go to the market to get their food substance, and since my music is substance too I believe the title fits World Famous Lexington Market." 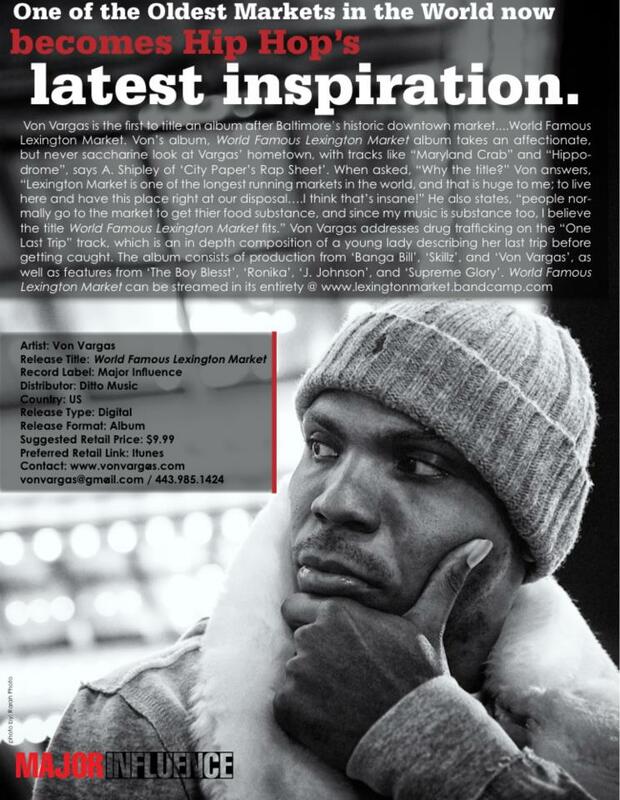 Von Vargas World Famous Lexington Market Full Length Album Cover. 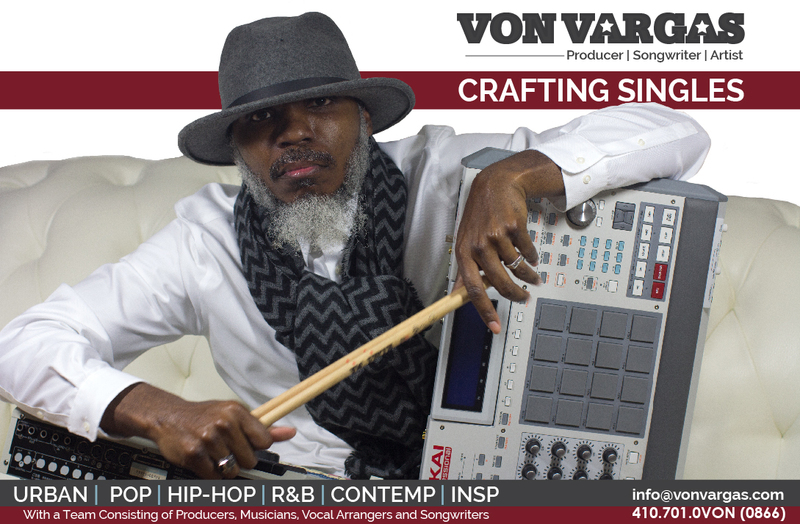 Please take a few minutes and sample some of the songs from Von's album World Famous Lexington Market. Von Vargas "Maryland Crabs" from the album "World Famous Lexington Market"
This is a City Paper Snapshot w/ Von Vargas' World Famous Lexington Market mention. It was featured in the weekly Rap Sheet section. 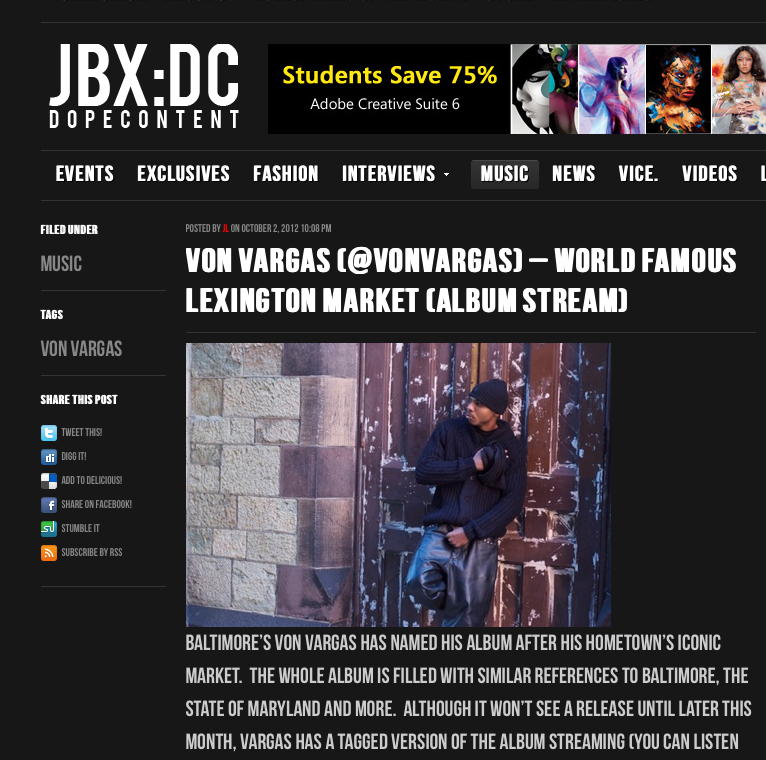 This is Jukebox Washington DC Snapshot w/ Von Vargas' World Famous Lexington Market mention. Here is a snapshot of page 1 of the album review and write up about World Famous Lexington Market written by Al Shipley. It was published in the Baltimore City Paper on December 12, 2012. 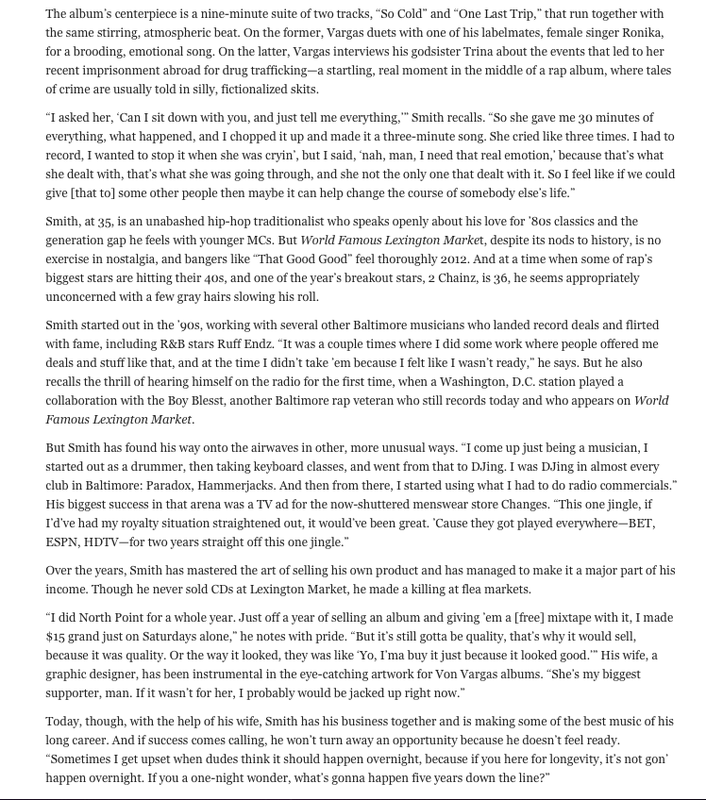 Here is a snapshot of page 2 of the album review and write up about World Famous Lexington Market written by Al Shipley. 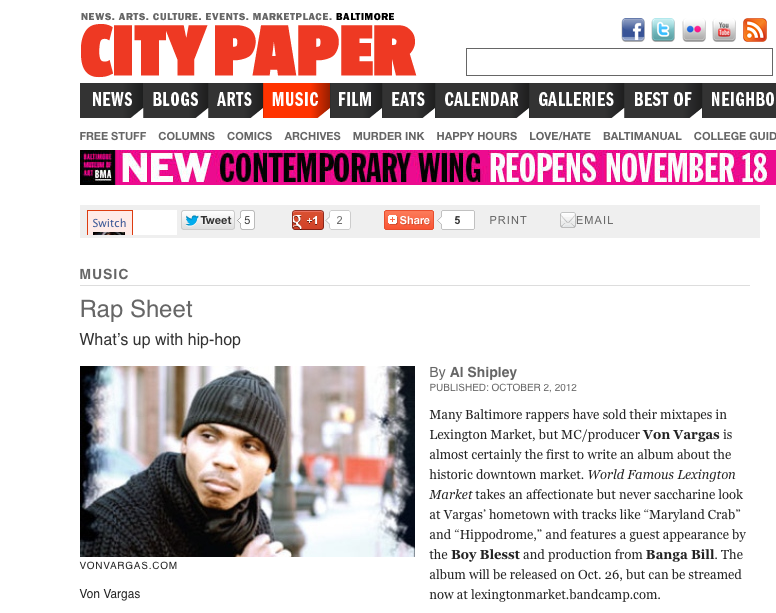 It was published in the Baltimore City Paper on December 12, 2012. 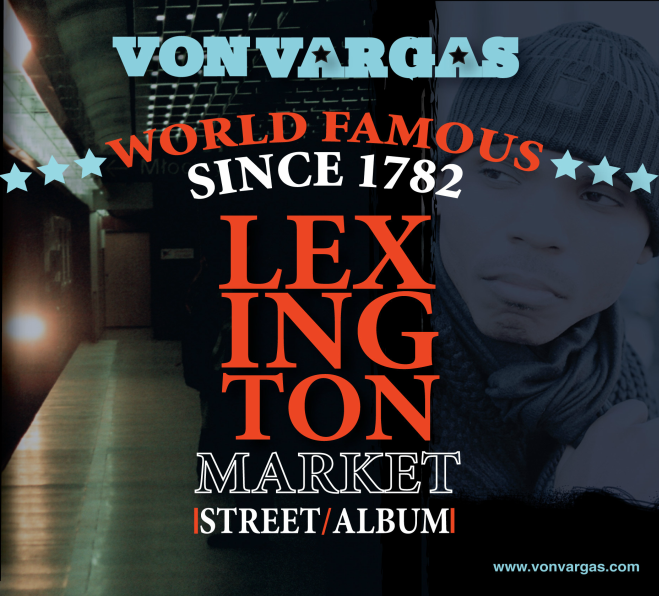 This was a quick onesheet to inform people about the Von Vargas' album World Famous Lexington Market. Von Vargas "Behind The Scenes"
This content is a group of videos or photos of Von Vargas "Behind The Scenes". Included are interviews, photo ops, production sessions, etc. Von Vargas sits down with Tyi Flood and her team at Flood Da Block Radio to discuss music, life, and In My Own Lane. Von Vargas interviewed @ University of Maryland College Park on WHUM 88.1FM by Dj Mic Terror. Von Vargas conducts an intimate session with students from Howard University sharing advice and music. Von Vargas conducts an intimate session with students from Georgetown University sharing advice and music. 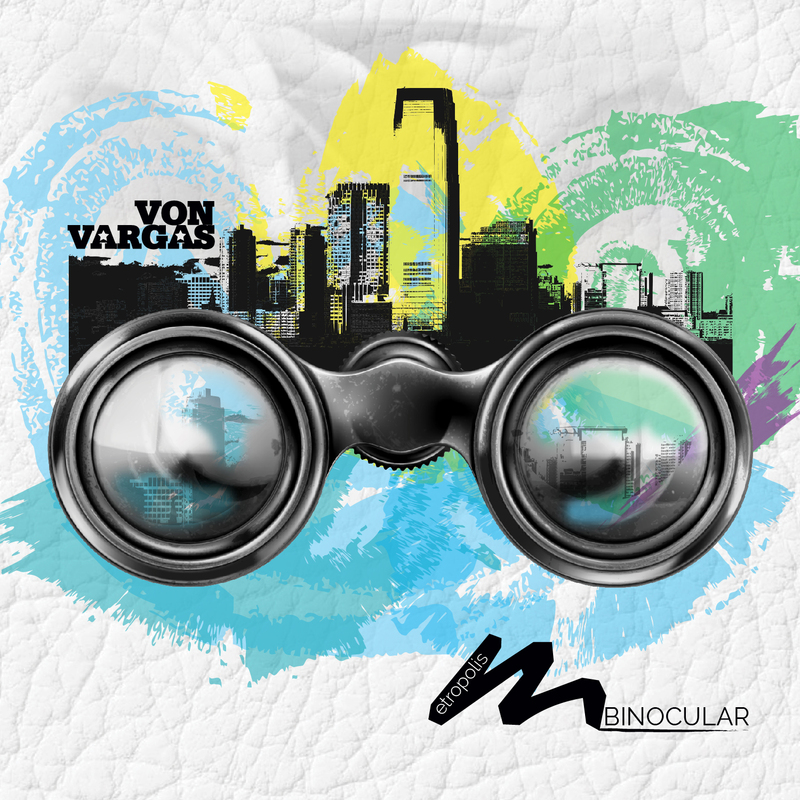 This is a full video of Von Vargas at his Metropolis Binocular Listening Lounge. A behind the scenes look on the video set for "No Tomorrow", a song written and produced by Von Vargas performed by Chrystal Lene'. 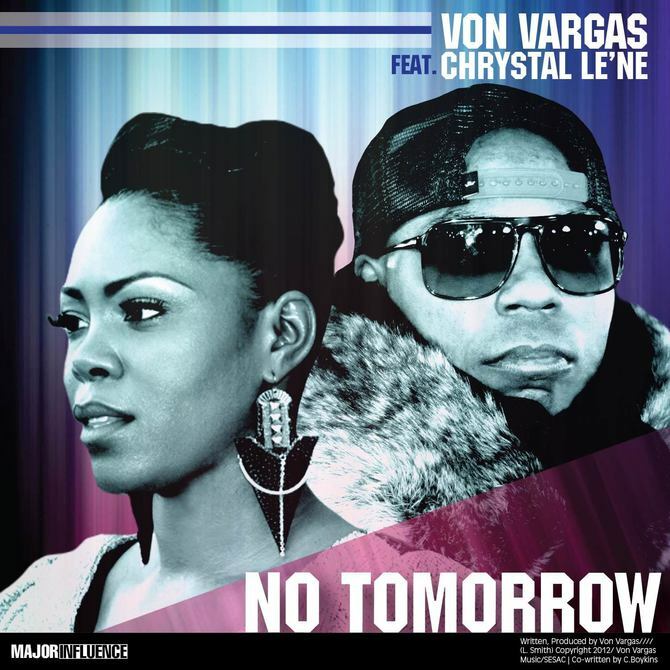 "No Tomorrow" music video was shot and edited by Von Vargas as well. Here are some full music videos from Von Vargas. Von Vargas ft. SHO "Cry A Tear"
This is the music visual to a song off of Von's album Metropolis Binocular. The song details the honest and sympathetic regret of losing a family member whose lifestyle was difficult to accept. This is the music visual to a song off of Von's album Metropolis Binocular. It details the consequences of family members choosing the wrong paths and washing away those mental processes. This is the promo visual for the Album Metropolis Binocular which is placed on the front page of my website www.vonvargas.com. It gives viewers a quick sample of the album while seeing lyrics and hearing the music. Unreleased music visual and song about respect,power,and reputation. Music video for Paradise Forever ft. Chrystal Le'ne performed by Von Vargas. Copyright (C) 2014 Major Influence. Music video for Find Ya Great (Decerio) ft. Jocelyn Faro performed by Von Vargas. This is an unreleased song and visual about using vulnerabilities to make an stand. Even after being teased or bullied about those vulnerabilities. Some brief snippets of Von Vargas in some of his recording studio sessions. The making of the song "Find Ya Great (Decerio)" featuring Jocelyn Faro. This song celebrates the life of the deceased hero lad Decerio Coley who sacrificed his life to save his younger sister from a burning fire. Music video for Paradise Forever (The Studio Sessions) ft. Chrystal Le'ne performed by Von Vargas. This is a studio session with Von Vargas and vocalist Ronika for his song titled "More Than The Fame". This is the third full length album that I released in 2010. This was the first time I recorded an actual album all by myself. Though I hear every flaw and wish I knew then what I know now, its still apart of my history and journey. 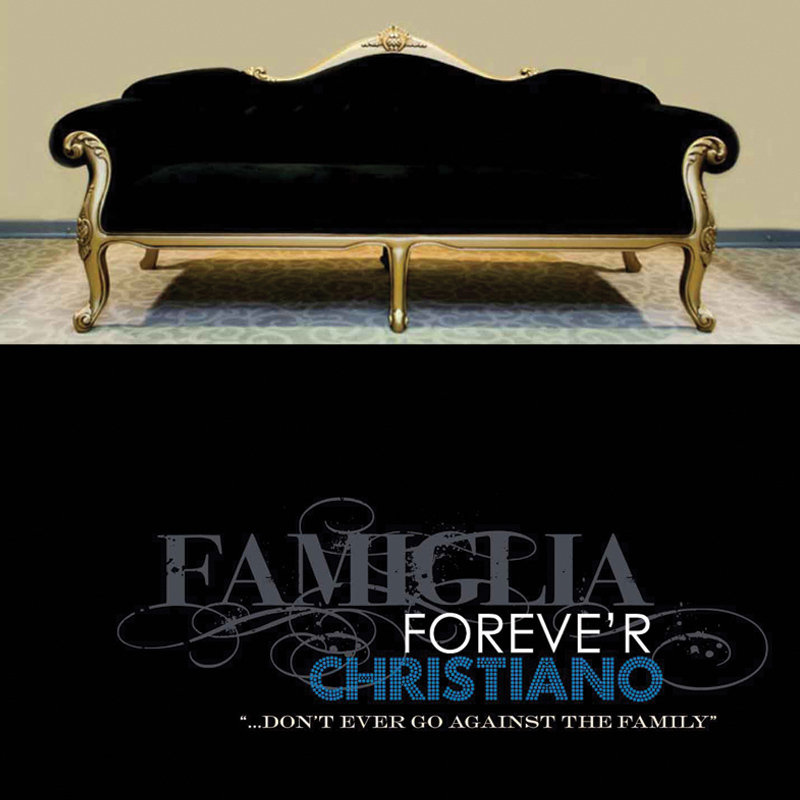 Famiglia Foreve'r Christiano was and still is a dope project. The photo shoot for the artwork was a mafia feel. Please download the digital booklet to view it. 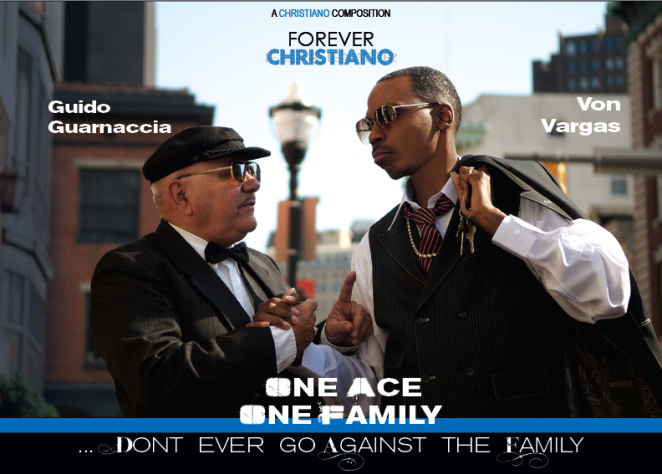 This was the lead video off of the album Famiglia Foreve'r Christiano which was originally released in 2011 and then taken down when the Von Vargas Vevo Station was created. It was then uploaded again to YouTube in 2013 after we loss a great number of video veiws. 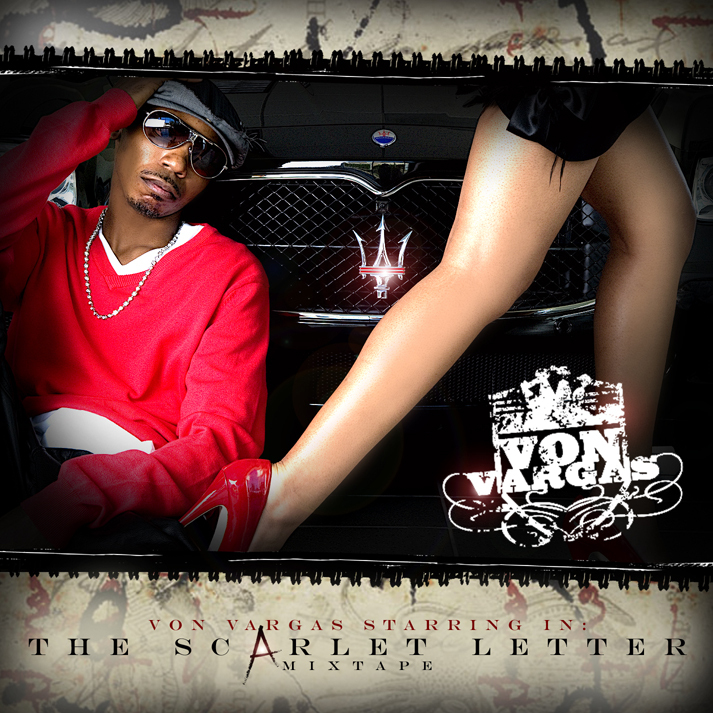 This is a few pics of album/mixtape covers, promo cards, pic etc throughout Von's music career. Von Vargas and collegues from The Recording Academy Advocating for music law and reform on Capitol Hill. 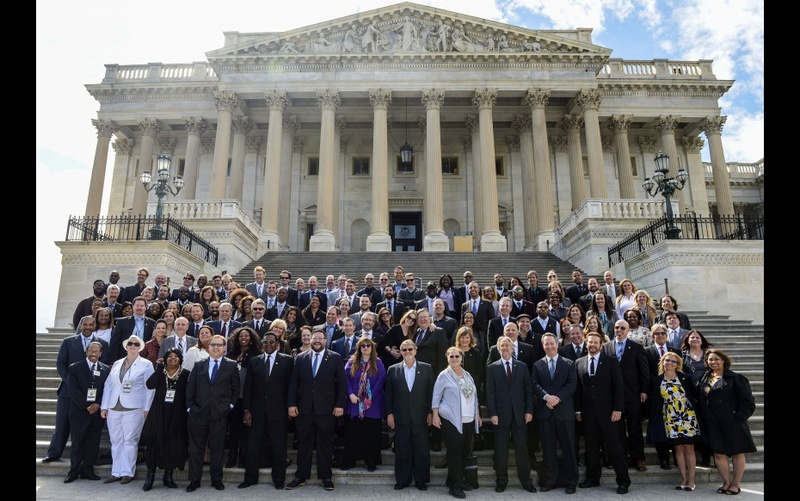 Grammys on the Hill is a yearly event where exclusive artist, musicians, and industry professionals from around the world join in Washington DC to lobby together. 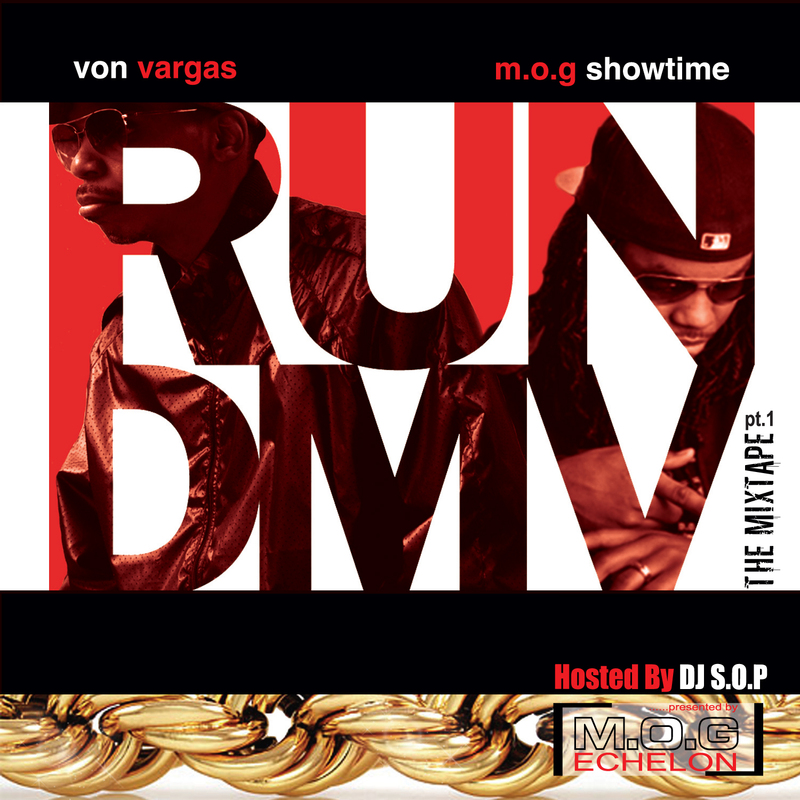 Von Vargas RUNDMV Album Artwork. 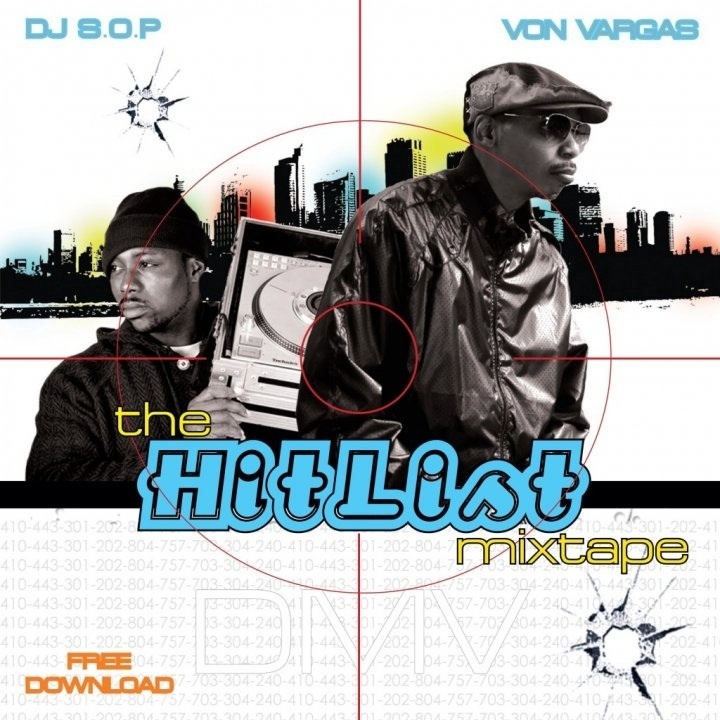 This was a mixtape album with Von Vargas & MOG Showtime.